John L. "Stub" Brickels (April 6, 1906 – March 17, 1964) was a high school, college and professional football coach who served as a backfield coach for the Cleveland Browns between 1946 and 1948. Brickels began his coaching career in 1930, after graduating from Wittenberg University in Ohio, where he was a standout as a halfback on the school's football team. He coached high school football and basketball teams in Ohio and West Virginia in the 1930s and early 1940s before becoming the head basketball coach at the University of West Virginia in 1944. He held that post until 1945, when Cleveland Browns coach Paul Brown hired him to recruit players for the Browns, a team under formation in the All-America Football Conference, while Brown served in the U.S. Navy during World War II. 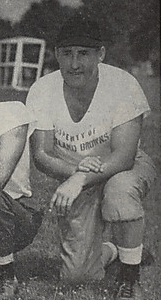 When the Browns began play in 1946, Brickels became the team's backfield coach, holding the post until he was named an assistant football coach at Miami University after the 1948 season. He was promoted to head basketball coach and athletic director the following year, and remained in that position until his death of a heart attack in 1964. Brickels attended Wittenberg University in Springfield, Ohio, where he played four sports and was a star halfback on the school's football team. He graduated from Wittenberg in 1930 and was a member of Phi Gamma Delta (FIJI). After graduating from college, Brickels, nicknamed "Stub", was hired as an assistant football and basketball coach at New Philadelphia High School in New Philadelphia, Ohio. He was promoted to head coach of both teams in 1932. During one successful run, his football team won 36 of 40 games. The team played numerous times against dominant Massillon Washington High School squads coached by Paul Brown in the 1930s, although New Philadelphia lost all of the matchups. Brickels went on to become head basketball coach and assistant football coach at Huntington High School in West Virginia in 1938. In 1944, he was named the head basketball coach at the University of West Virginia, and led the team to the National Invitation Tournament in 1945. Paul Brown, who was serving in the U.S. Navy during World War II and coaching a service football team at a base outside Chicago, hired Brickels in 1945 to help him organize the Cleveland Browns, a new team in the All-America Football Conference. Arthur B. McBride, the team's owner, had hired Brown as head coach and general manager, but Brown was hamstrung by his military service and needed Brickels to help recruit players. Brown chose Brickels because of his easygoing and glib manner and familiarity with the Ohio sports scene. Brickels set up an office in downtown Cleveland and visited with players Brown was interested in signing. Brickels mostly did Brown's bidding and signed numerous players on his behalf, but he also brought two men to Brown's attention who later joined the Browns and had long careers with the team. Center Frank Gatski and guard Ed Ulinski both played at Marshall University in Huntington when Brickels was coaching high school there. Gatski had a Hall of Fame career in 11 seasons for the Browns, and Ulinski played four years for the team before becoming a long-time Browns offensive line coach. When the Browns started play, Brickels became a backfield coach. He stayed with the Browns for three seasons, after each of which the team won the AAFC championship. Brickels left the Browns in 1949 to take a job as an assistant to football coach Woody Hayes at Miami University. The following year, he was named the school's athletic director and head basketball coach. Brickels died in 1964 of a heart attack while still the athletic director at Miami. He was inducted into Miami's athletics hall of fame in 1971 and into Wittenberg's hall of honor in 1986. 1 2 3 4 5 6 7 8 "Brickels' Rites Set; Ex-Paul Brown Aide2". Cleveland Plain Dealer. March 18, 1964. p. 34. 1 2 "John Brickels". Wittenberg University. Retrieved August 28, 2012. 1 2 3 4 "Official Souvenir Program, All-America Championship, Cleveland Browns vs. New York Yankees". December 22, 1946: 14. John Brickels, Backfield Coach, Graduate of Wittenberg College ... Assistant football and basketball coach at New Philadelphia (O.) High School in 1930 and 1931 ... Head coach in both sports at same school from 1932 to 1938 ... Head basketball coach, assistant in football at Huntington (West Va.) High School from 1938 through 1944 ... Head basketball coach, assistant grid mentor at West Virginia University in 1944-1945. ↑ Cantor 2008, pp. 205–206. ↑ "Brown Signs 2 Stars for New Grid Team". Cleveland Plain Dealer. April 1, 1945. p. 1C. 1 2 3 4 Cantor 2008, p. 81. ↑ Cantor 2008, pp. 75–81. ↑ Cantor 2008, p. 83. ↑ Piascik 2007, pp. 23–24. ↑ Keim 1999, pp. 67–70. ↑ Heaton, Chuck (September 27, 1986). "Bay man's device measures force, speed". Cleveland Plain Dealer. p. 3C. Ed Ulinski, who retired last spring after more than three decades as a player and coach with the Browns, was inducted into the Marshall University athletic Hall of Fame last weekend. ↑ Piascik 2007, pp. 64, 81, 124. ↑ "Hall of Fame Inductees". Miami University. Archived from the original on October 7, 2012. Retrieved August 28, 2012. Keim, John (1999). Legends by the Lake: The Cleveland Browns at Municipal Stadium. Akron, OH: University of Akron Press. ISBN 978-1-884836-47-3.